For the salted caramel sauce, place the sugar, two tablespoons water and golden syrup in a saucepan and bring to a boil, stirring occasionally. When the sugar has turned a rich amber colour, remove from the heat and stir in the butter, cream and salt. Pour into a bowl, cover the surface with cling film and cool completely. For the mousse, melt the chocolate and butter in a bowl set over a pan of simmering water – ensuring that the bottom of the bowl does not touch the water. Set aside to cool a little. Then whisk the egg yolks into the cooled chocolate mixture and add the vanilla. Pour a tablespoon of salted caramel sauce into the bottom of each serving glass. Top with one-third of the mousse mixture. Drizzle over enough sauce to cover the mousse. Repeat this layering with mousse and caramel, finishing with a final layer of mousse. Refrigerate for an hour before serving. If chilled for longer, remove 30 minutes before serving. 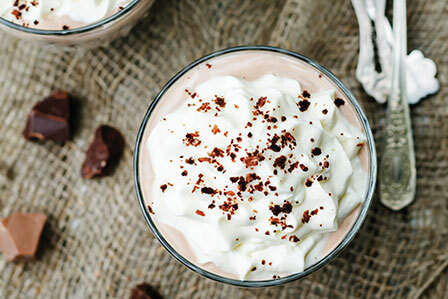 Finish with a dollop of whipped cream and chocolate shavings.